I took this non-descript shot a few days ago at Hollywood Studios. To most people, it is just the back of the Keystone Clothiers building on Hollywood Boulevard. 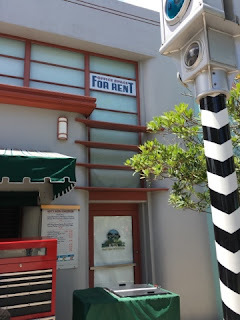 However, the Office Space for Rent sign, as well as the Holly-Vermont reference on the door, have great significance. It refers to the start of the Walt Disney Company, in 1923. Walt and Roy rented a room in the back of this real estate office, and the rest is history.